The Airsoftology Podcast: Episode #2 is Available. We’ve put together another show for the airsoft enthusiasts out there, and this one won’t disappoint. The show covers all of the current airsoft news, gear, gun reviews, and tech tips…along with a healthy dose of irreverence. Don’t forget, we want to hear comments and questions from our listeners. Visit the Airsoftology website at www.airsoftology.com to see how you can be a part of the show! We discuss the latest in airsoft news and rumors from around the web. We announce the winners of the Super Gun Pole giveaway! Tim, Jonathan and Chris answer your questions and talk about the listener "loadout of the show". We review the Echo1 MP5 Master Series and the TAD Gear Ranger Hoodie v4.0. Chris demystifies motors in his Tech Tips segment; we cover the break-in process and the common problem of motor adjustment. Show notes are available here. 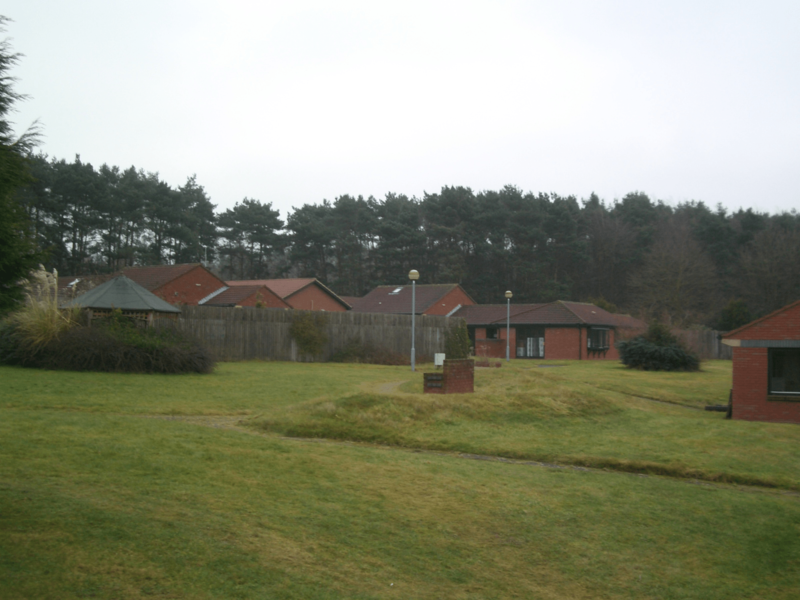 First and Only News: First and Only are proud to announce our new and biggest urban (FIBUA) site we have opened so far!!! 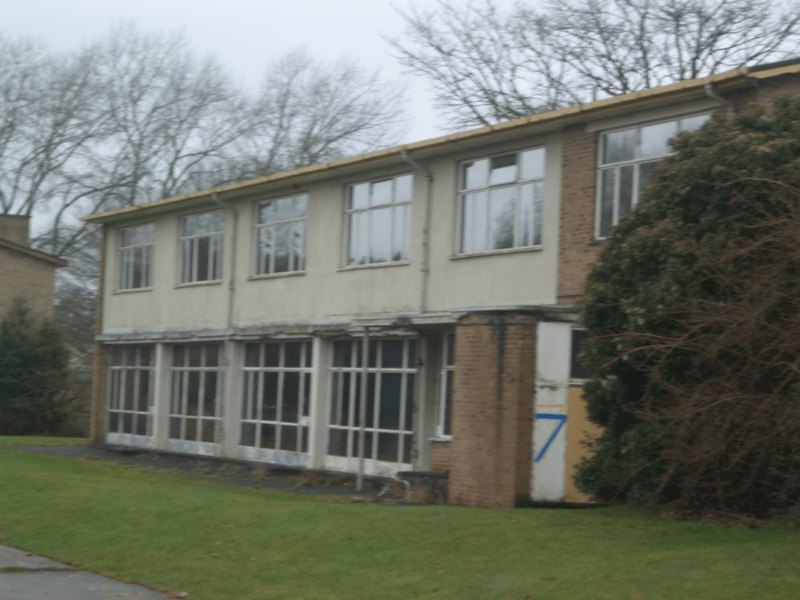 It is called the Asylum and is based just outside Kidderminster near Birmingham. 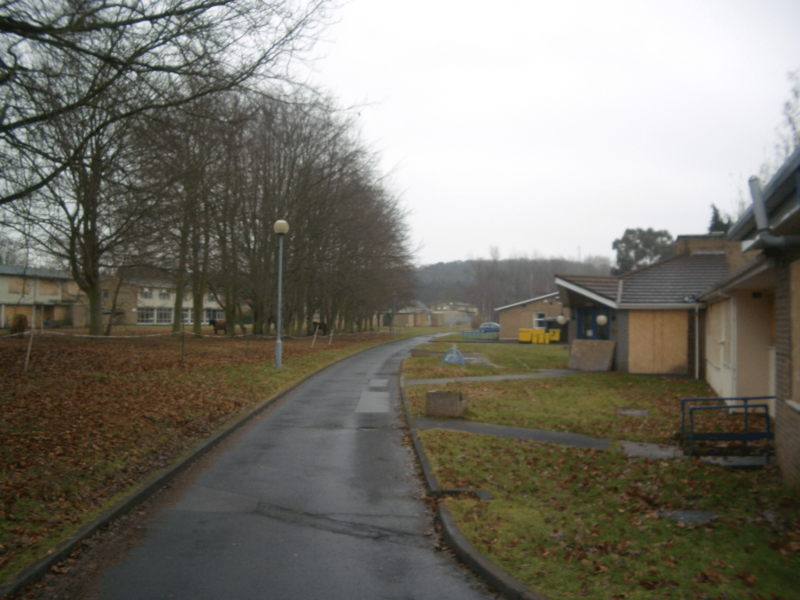 It compromises lots of buildings both large and small to play over and in, road networks, woodlands and everything you would expect from a top class urban site. 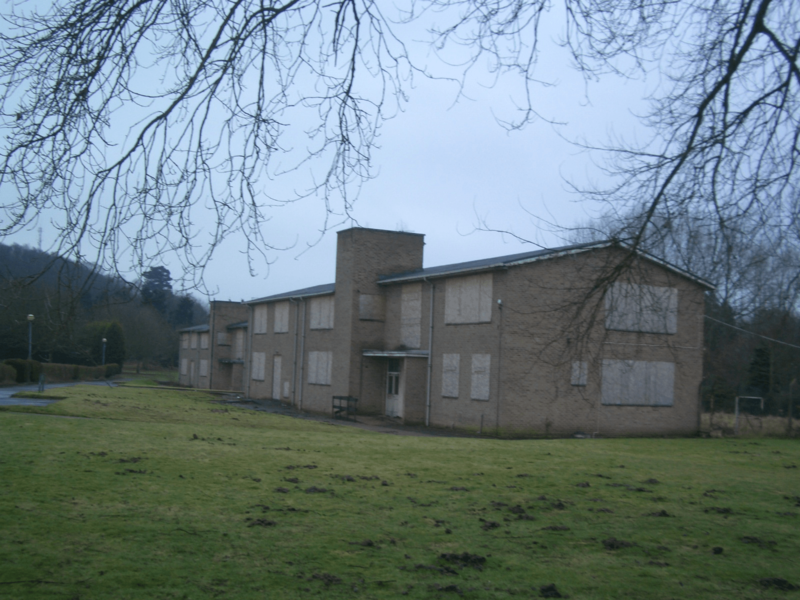 We are holding our first open day on Sunday 22nd of February, with a member’s day for first and only members on Saturday the 21st. More information on all these sites and details of how to book on to games can be found on our forums. 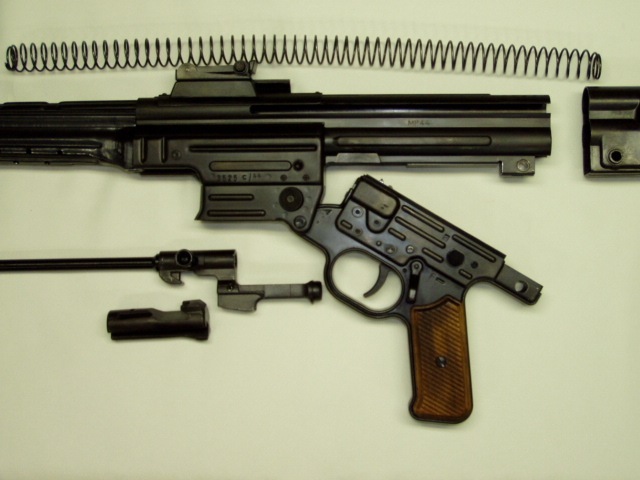 If you are a shop or local distributor looking for Tokyo Marui then contact us. The Official European Tokyo Marui Distributor and Service Center is www.tacticaltechnology.it (T&T). We give 2 years guarantee on all products sold in accordance with EU legislation. T&T only serve wholesale to retail and local distributors. We also have other products and brands with over 3000 different items in inventory. Register your business on our web site. Once your account has been approved you will gain access to pricing and availability. Spartan Imports Update: BLAMMO KILL-MARKERS, the ONLY true marking Airsoft BB! Introducing the Blammo Kill-Marker, now distributed by Spartan Imports! 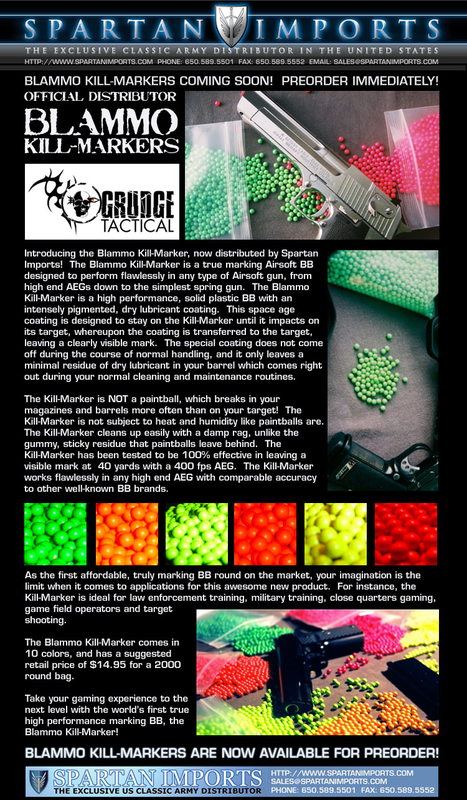 The Blammo Kill-Marker is a true marking Airsoft BB designed to perform flawlessly in any type of Airsoft gun, from high end AEGs down to the simplest spring gun. The Blammo Kill-Marker is a high performance, solid plastic BB with an intensely pigmented, dry lubricant coating. This space ag coating is designed to stay on the Kill-Marker until it impacts on its target, whereupon the coating is transferred to the target, leaving a clearly visible mark. Thank you very much for your continued patronage. 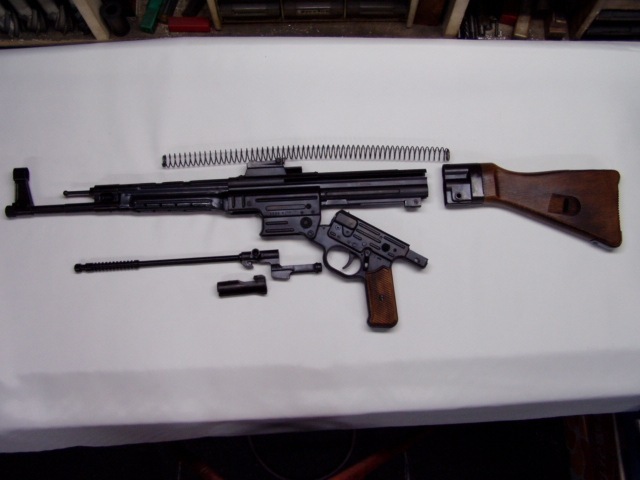 We are manufacturing MP44 model gun now. Those sale is being planned in the end of February – the beginning of March. When there is an order, please tell me about it. Although I feel sorry, those who have already reserved also need to place an order anew for a check. We will not manufacture most except the number of the orders. 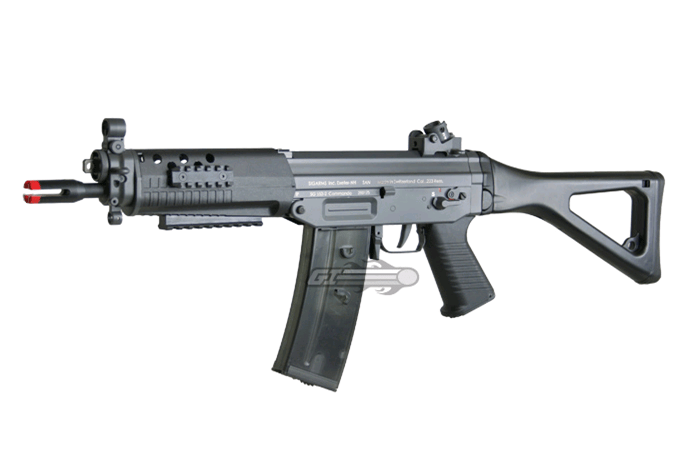 Moreover, some of MP44 air blowback BB gun are in stock. When required, please tell me about it. I apologize for having become mail troublesome for those who are not interested in this notice. P.S. 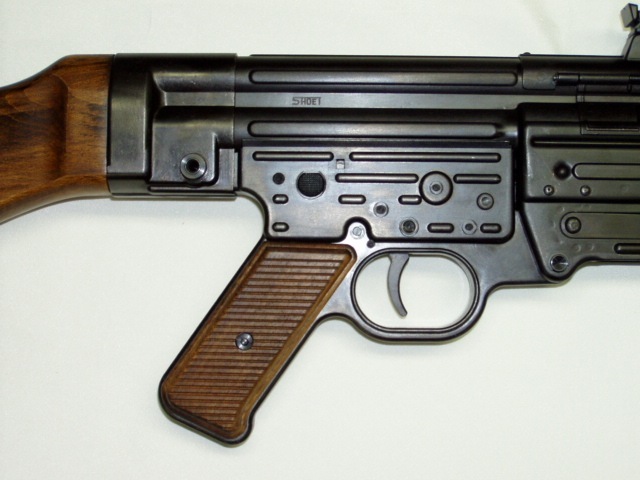 Next, FG42 Type 1 model gun is manufactured. 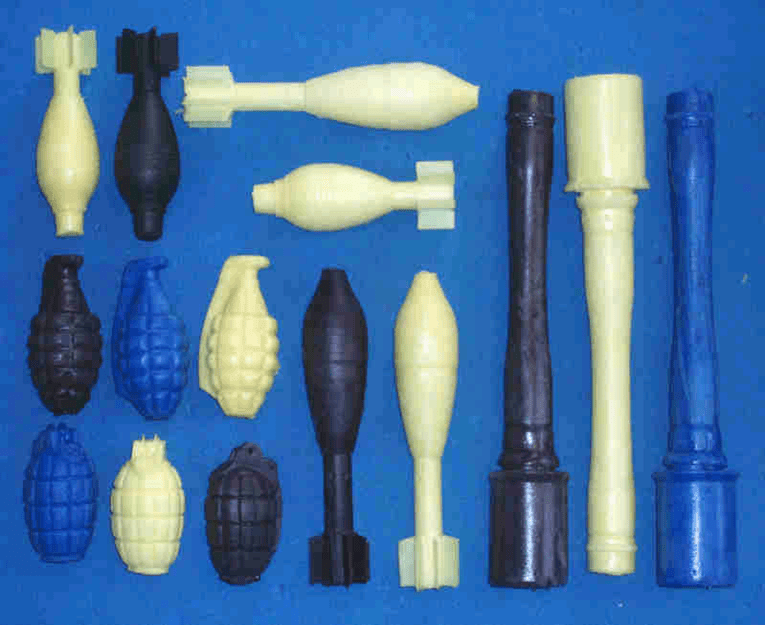 Mil-Sim Labs has just released a new line of replica ordnance, cast in soft foam. No longer do players have to resort to using children’s toys, such as fined footballs and rubber balls to simulate ordnance on the battlefield. 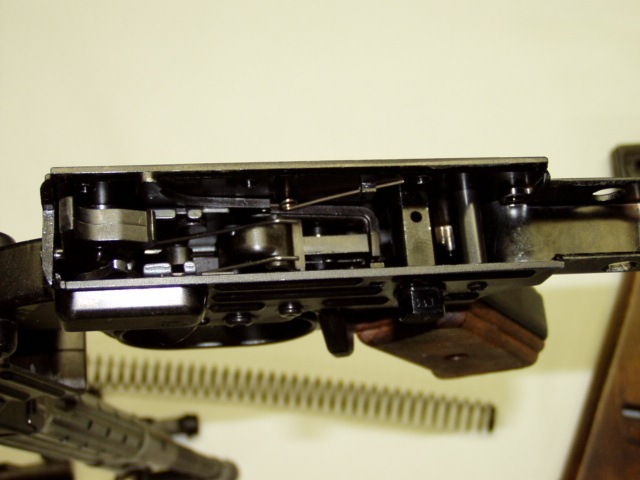 Most of the molds are made from inert ordnance yielding a very realistic looking product, but looks are just the beginning! All of the foam ordnance accepts our new ACTIVE IMPACT SYSTEM tm . 5CM German, Leichte Granatwerfer 36 Mortar Round. On the drawing board for future projects, Panzerfaust Projectile, Bazooka Rocket, and a British 2” mortar round. On the modern end of things, we are looking @ 81 and 60mm US mortar rounds, M26 Hand Grenade, Claymore Mine, and a RPG2 Rocket. The mortar rounds fit a 2” PVC barrel., dropping down the barrel smoothly. 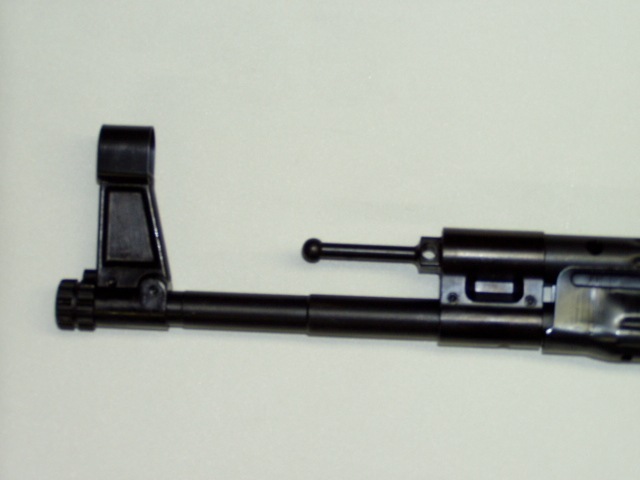 The M-37 has an optional tip that holds 10 grams of powder. For the modern player it also fits 40mm launchers. The soft foam and lack of internal core makes this product much safer then the toy fined footballs currently used to simulate ordnance @ many events. 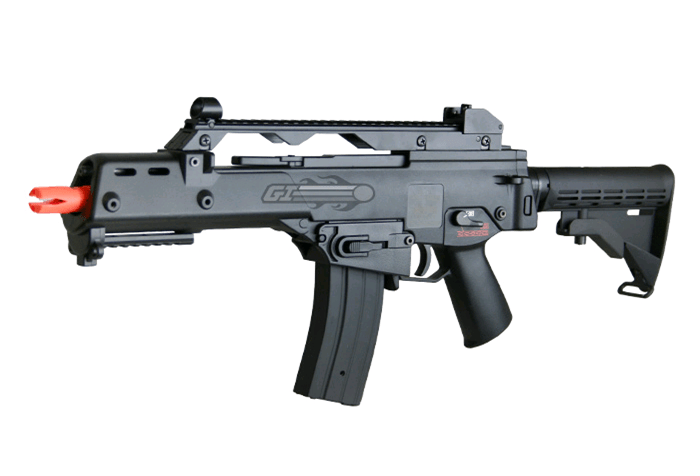 Many new releases are now available at Airsoft GI, first up, the Echo 1 MTC. 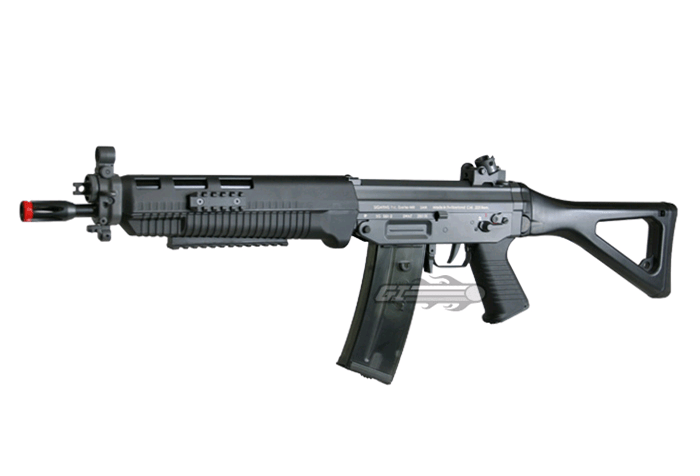 A full write up comparing the MTC to the G36c is in the works. In the mean time be sure to keep an eye on our YouTube Channel (http://www.youtube.com/user/AIRSOFTGIdotcom) for next video review. 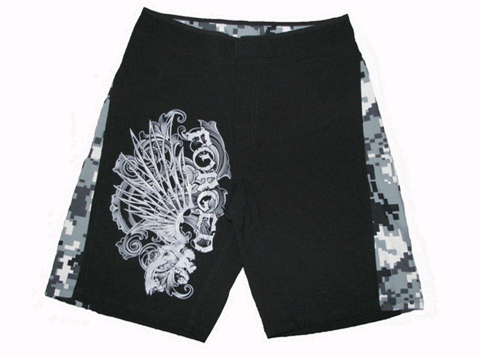 Forged Hybrid Shorts : We designed these shorts as a versatile hybrid between board shorts and dedicated fight shorts. They also work extremely well for Crossfit. You can roll on the mat, knock out a CrossFit PR, and then cruise the board walk in the same pair of shorts. Made of stretchy 100% Polyester, they feature a secure overlapping velcro closure as well as a drawstring. 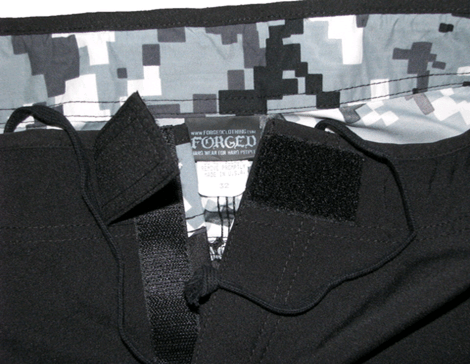 The large flat pocket has drain holes and a velcro closure so it’s out of the way when not in use. It’s also the perfect size to safely hold your cell phone and wallet if you have to run around town. Greetings. I would like to let you know that Ridge Outdoors has new models for 2009. 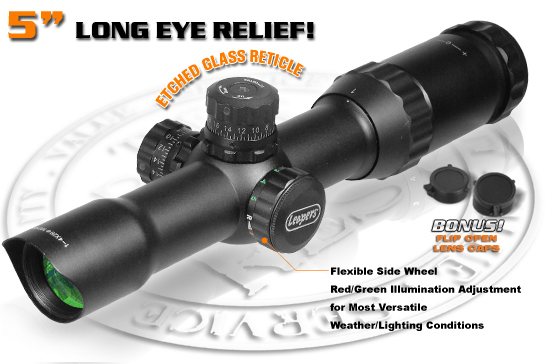 Please visit our website at: www.ridgeoutdoors.com. If you would like more information and distributor pricing, please contact us today. ButlerPatches.com is offering a 10% discount off our price list for custom embroidered airsoft patches, for all members of arniesairsoft.co.uk. We offer free setup and design, unlimited edits, free shipping and a turnaround time of 8-12 days or 2-4 days rush delivery. We guarantee that we have the lowest prices in the custom patch industry, and will match any competitor’s price by 10%. 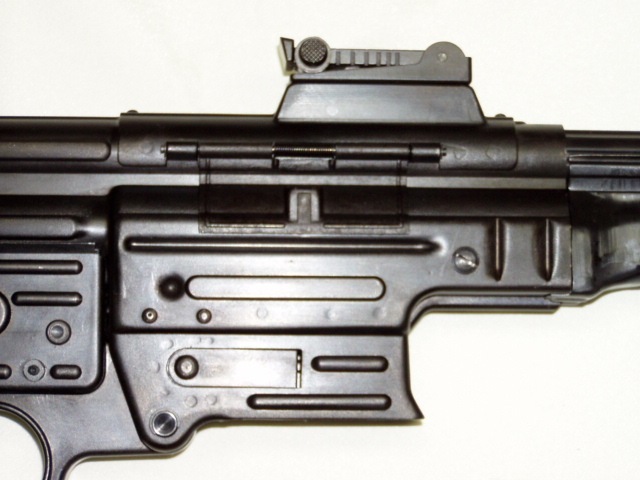 Please visit our site at ButlerPatches.com and fill out the free quote form, mention arniesairsoft.co.uk and we will quote you a 10% discount from our price list.